General Store | Phelps, NY - Phelps Mercantile, Inc. Your Hometown Country General Store! Pick up everything you need at The Mercantile. We are a small-town general store that stocks everything from hardware to farm supplies. Our shelves are stocked with a wide variety of goods for customers in Phelps, New York, such as pet food and propane. We also offer delivery to customers throughout the surrounding area. As a local business, we are ingrained in the community here, and that's why we go above and beyond to ensure you are satisfied as a customer. Come visit our store today and view our large selection; we look forward to meeting you. Contact us to find out about our delivery options. 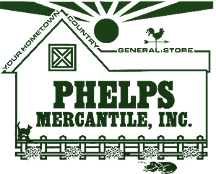 Phelps Mercantile, Inc. was founded by John Uveges and Jim Cheney when they bought out the old Phelps Agway branch. The Agway had been serving Phelps, New York, for more than 30 years, and John was determined to keep the business going. John and Jim signed the final paperwork in July 2000, and they began transforming the store into a successful general store with a great selection of products. Over the years, the store has doubled in size and expanded its selection. Today, The Mercantile offers quality household goods and hardware, while continuing to provide the services that Agway customers know and love, such as feed delivery and small engine repair. We are proud to continue a long tradition of providing quality goods and friendly service to our community.